Access to clean, sustainable supplies of water is essential for Canada’s major natural resource sectors — energy, mining, forest, and agriculture. Our ecosystems also depend upon those same clean, sustainable water supplies, creating the potential for competing uses. With development of the natural resource sectors on the rise, does Canada have enough water to support economic growth while maintaining the health of our country’s ecosystems? And are we in a position to sustainably manage our water resources for future generations? The NRT is conducting a two-year program on Water Sustainability and the Future of Canada’s Natural Resource Sectors examining the relationship between water and the forestry, mining, agricultural, and energy sectors. The Phase I report, entitled “Changing Currents”, was released in June 2010 and examined principal water uses by Canada’s natural resource sectors and identified key water issues. Phase II, which will be released at the end of 2011, undertook research into the potential solutions to these issues. This work involved the research and engagement of some of the country’s leading experts on water management and policy, and collaboration with key industry representatives and associations, as well as several watershed-based non-governmental organizations. The focus and approach of the program was guided by an Expert Advisory Committee. The NRTEE held several consultation meetings across the country, involving over 150 experts and stakeholders. As well, the findings and conclusions of this study have been peer-reviewed by specialists in the different areas of investigation. 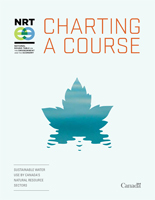 In June 2010, the NRTEE released Changing Currents: Water Sustainability and the Future of Canada’s Natural Resource Sectors. This report provides a description of the relationship between Canada’s natural resource sectors and water, focusing on the current and emerging key water issues facing the sectors. The purpose of this forum was to bring attention to critical aspects of water use by Canada’s natural resource sectors, and raise the profile of actions required to better manage our water. On June 17th, the NRTEE hosted a plenary session at the Canadian Water Summit entitled “Water Sustainability and Canada’s Natural Resource Sectors: Realities, Barriers and Opportunities”. Panelists discussed both the barriers that stand in the way of improved water management and the possible solutions for better ecosystem health and sustainable economic prosperity. The NRT collaborated with the Water Policy and Governance Group on a workshop designed to explore the changing landscape of water governance in Canada, focusing on implications for industries in the natural resource sectors. Dans le cadre du programme de recherche, la TRNEE lance, en collaboration avec les principales associations industrielles du Canada de chacun des quatre secteurs, une série de tables rondes sectorielles multilatérales. La table ronde sur le secteur forestier a lieu le 24 novembre 2009 à Montréal en collaboration avec la Association des produits forestiers du Canada. The National Round Table in collaboration with the Canadian Federation of Agriculture (CFA) hosted a Round Table meeting of stakeholder/experts from the agriculture community to discuss issues pertaining to the future of Canada’s water resources and the agriculture sector. The National Round Table, in collaboration with the Canadian Association of Petroleum Producers (CAPP), hosted a Round Table meeting of stakeholders/experts from the oil and gas industry to discuss issues pertaining to the existing and future use of Canada’s water resources by this sector. The National Round Table, in collaboration with the Canadian Nuclear Association of Canada (CNA), hosted a Round Table meeting of experts from the nuclear energy community to discuss issues pertaining to the existing and future use of Canada’s water resources by the sector. The National Round Table, in collaboration with the Mining Association of Canada (MAC), hosted a roundtable meeting of stakeholders/experts from the mining community to discuss issues pertaining to the existing and future use of Canada’s water resources by the mining sector. The NRT solicited advice from close to 50 stakeholders from across Canada representing the natural resource sectors, academia, Aboriginal, non-governmental organizations and governments. The aim was to inform the NRT on where it could provide the greatest value and to confirm the key current and emerging issues and opportunities in the interface between the natural resources sectors, climate change, and water use.